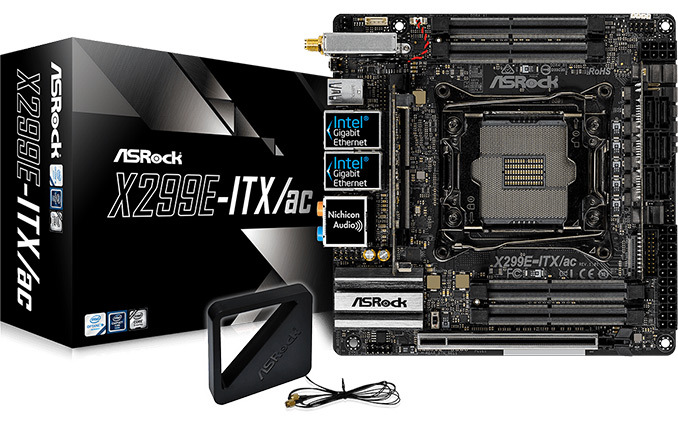 ASRock formally introduced its X299E-ITX/ac motherboard at Computex earlier this year and attracted a lot of attention to the product that was (and still is) the only Mini-ITX mainboard for Intel’s Core i7 and Core i9 processors in LGA2066 packaging. ASRock had said that this week it has started shipments of the motherboard and it is now available from multiple retailers. It is noteworthy that since Computex, ASRock has removed the support for the Kaby Lake-X CPUs and therefore the chips will not work on this motherboard. It is compatible only with Skylake-X processors, and enables a user to build a Mini-ITX PC with a CPU featuring up to 18 cores. 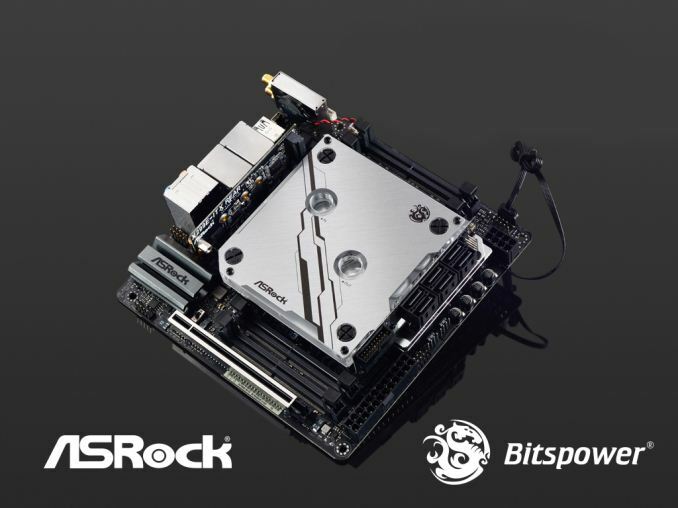 Since such CPUs have a TDP of 165 W (often drawing more than this at load), and as it can be difficult to find a small cooler for such power, ASRock has worked with Bitspower to develop a custom water monoblock specifically for the X299E-ITX/ac. This monoblock is also being made available. Despite its small size, the ASRock X299E-ITX/ac supports most of the benefits that Intel’s X299 platform has to offer: it has an advanced VRM with seven phases, 60 A inductors and 12K solid-state capacitors enabling CPU overclocking, it has four SO-DIMM DDR4 memory slots for full memory bandwidth support, one PCIe 3.0 x16 slot for graphics cards, and three M.2 slots for SSDs (PCIe 3.0 x4 or SATA). Expandability does not end there - the X299E-ITX/ac carries six SATA 6 Gbps ports, a 2x2 802.11ac Wi-Fi + Bluetooth 4.2 module (based on an Intel controller), two GbE ports from Intel controllers, two USB 3.1 10 Gbps headers (a Type-A and a Type-C), six USB 3.0 connectors, a 7.1-channel audio sub-system enabled by the Realtek ALC1220 controller and so on. In order to fit everything it wanted onto a Mini-ITX PCB, ASRock had to place the USB 3.1 controller, SATA ports and one M.2 slot on custom daughter-board modules - essentially going vertical when they ran out of horizontal space. Such modules add certain dimension-related limitations to the size of CPU coolers (it remains to be seen how higher-end M.2 SSDs perform when located near a CPU cooler) and that is a problem because all of the Core i7 or i9 processors supported by this motherboard have TDP of 140-165 W, and it is not easy to cool such chips down. In fact, when it comes to the X299E-ITX/ac, a custom liquid cooled setup could be the most optimal choice from performance and dimensions point of view (again, assuming that an appropriate chassis is used for the build). Bitpower has developed a custom waterblock/monoblock specifically for the X299E-ITX/ac, with a product ID of BP-WBMASRX299EI. This monoblock features a copper base with a nickel finish with two G1/4" fittings and even RGB lighting. The waterblock is available directly from the manufacturer and it is compatible with standard pumps and tubings. Speaking of availability, the ASRock X299E-ITX/ac is now available from Newegg for $400 (although it already looks to be sold out as we wrote this piece). In Europe, three stores are taking pre-orders and are charging from €424 to €461 ($502 to $546) per unit, so the motherboard is quite expensive, possibly because it is unique. Here you go. Possible use cases: a) customers who want to show off, and build smallest and yet the most powerful machine available, b) workstation build with extremely small footprint, enough to put it beside monitor, not under the desk, c) as second motherboard in dual-system build, for handling storage and other background tasks (stream capture? And I'm not talking about video only), d) high density computing, without going full-server grade, e) backup system for a full-fledged workstation, with offline computing/rendering capability (main system offline, I mean). I have a dynatron r30 low profile cooler on a 160watt xeon 2696 v4 cpu. It works well. There are a few options. Also you can go with aio which the case allows. "Why couldn't laptop RAM go back there? "